All AVA RIAA phono preamps are suitable for any normal output phono cartridge, head amp, or moving coil step-up transformer. 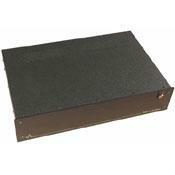 They come packaged in our rock solid 17" wide x 12" deep x 3.5" high chassis. They have gold plated phono inputs, gold plated line outputs, and a lighted power switch. Connect one to your line preamp or receiver and enjoy records all over again. The Ultra Hybrid RIAA Phono Preamplifier has the same amazing phono circuits found in the full function Ultra Hyrid preamplifiers in our SL or EC chassis. Your records never sounded this good. Available factory-wired only. This review is for a Van Alstine Ultra SL Hybrid preamp with mosfet upgrade . Not just a great value , the Ultra Sl is suprior in almost every aspect. Its most important quality is the pure musical pleasure it gives; it makes you forget audiophile crap and simply enjoy the music in a new and exciting way. I was looking for is a combination of these two worlds - solid state and tube. And the gamble proofed to be a true winner. The Ultra SL is very natural and very detailed. It has just a prefect bass - lush and focused, not a little bit exaggerated. It is transparent and creates a wide and deep sound stage. It sounds amazingly lifelike; it excells with vocals, acoustic guitars and bow instruments. Is that good ! All I can say is this is a wonderful preamp with an absolutely good affordable price . ( for me the amp is looking very simple style old fashion classic some people hate it some people love it it`s your decision ! ) I like it !